Pasteis de Nata. 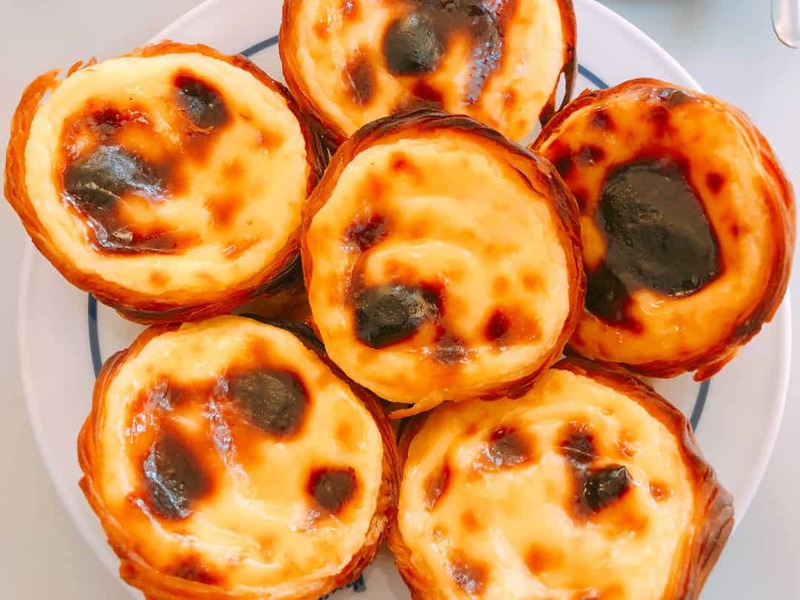 Layers upon layers of flaky pastry, with a soft, melt-in-the-mouth buttery feel to it is the first thing you will notice when you bite into one of these Portuguese delicacies. The status of the sweet treat you are about to devour is decided right here before you take another mouthful. The next bit, the one that allows you to really sink your teeth into the custard mixture will make or break it. The egg custard must be warm, must actually taste like egg and must have a consistency that is soft and velvet-like. There’s no room for a hard set custard here and it absolutely must be made from eggs, not custard powder. They are called many things. Most commonly, people will call them Portuguese pastries, or Portuguese custard tarts or even Portuguese egg tarts. To be correct, they are Pasteis de Nata, or Pastel de Nata if you are talking about them singularly. They are an institution in Portugal, where they were founded. Imposters around the world have tried to mirror these tasty treats, often producing something that might even resemble the original pastry, but the proof, as they say, is in the pudding. Not all Pasteis de Nata are made alike. In fact, many of the producers of Pasteis de Nata in Portugal use recipes that are generations old, passed down from family to family, and protected from copying through the careful dissemination of details. For such a simple looking tart, they are actually quite labour intensive to make, mirroring part of the process of making croissants. As visitors to Portugal, we thought it only fair that we contributed to their economy by eating as many Pasteis de Nata as we could. Make no mistake, the plural “pasteis” definitely related to us! On our campervan trip from Lisbon to Porto and everywhere in between, we enjoyed tasting as many of them as we could. As I explained in my article on things to do in Belem, the beginning of the pastry we now call Pasteis de Nata began during the 19th century. Following a revolution where all clergy were expelled from their places of worship, the first tart was made by a monk in a shop that neighboured the Jerónimos Monastery. Whilst done initially to make money to survive, the recipe was later sold to the descendants of the family that continues to run the Pasteis de Belem bakery today. With their own branded Pasteis de Belem, they are not only the forerunner of these iconic treats but also the oldest surviving manufacturer of Pasteis de Nata in Portugal. Today, they are literally everywhere. Every cafe, coffee shop, bakery and restaurant sells them. Even corner stores and small grocery shops sell them. Despite this, and I will vehemently defend this statement, all Pasteis de Nata are NOT made equal. To say so would be to admit that such things as croissants are all the same, irrespective of where you might find them. One only has to travel on an aircraft out of France or to buy some commercial rubbish from a supermarket to know this isn’t true. I care not that people might choose to eat them from less than authentic producers. Each to their own. All I’m saying is, there is daylight between the real deal and imitations that are commercially manufactured using any old ingredients. How are Pasteis de Nata made? The secret to making the best Pasteis de Nata, is well, a secret. With the major producers like Belem bakery and many others holding their recipes close to their chest, it becomes a “best guess” as to the ingredients and the process especially. We do know that the ingredients largely centre around eggs, flour, butter, milk, sugar and cinnamon. Everything must be as fresh as possible. At the Belem bakery, the recipe is such a secret that only the family and three chefs are privy to the information. All preparation is done behind a secret steel door, where access by anyone other than the chefs is forbidden. Only when they are ready to be cooked do they make an appearance. On the other end of the spectrum, chain Manteigaria allows you to watch their staff make the Pasteis through glass windows, totally exposing their kitchen and their process. The key, as we found during our tasting experiment is to get the pastry right first up. The pastry is a form of puff pastry. If you look closely at the image below, you can see a circular pattern in the dough. It is crucial to use real butter and to laminate and fold puff pastry in a particular order. Failure to do so will confuse the layers, almost like cross-threading a screw, and the pastry simply won’t puff up and be light and flaky. The dough is then lightly pressed out into the tins, forming the base for the tarts. The custard is added and they are cooked at a very high temperature until they are golden brown. Depending on the baker, some of the tarts are more golden, whilst others take on more of a burnt look. Bakeries selling Pasteis de Nata can sell thousands of these a day, with the more famous Belem location selling approximately 20,000 every day. On weekends, sometimes it doubles. Visitors like us eat our fair share but it is the locals, stopping by for a morning treat, or picking up a box to take home for after dinner, that is responsible for eating most of them I would suggest. 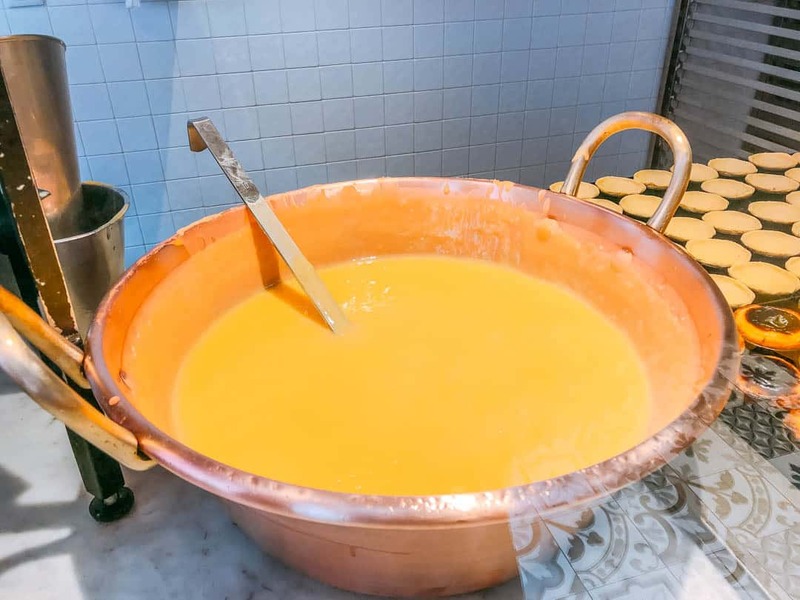 We sampled as many as we could over the course of 10 days in Portugal, but there is a limit to just how many can be eaten, especially when we were enjoying the other Portuguese food as well. We did our best though. Now, we aren’t normally ones for eating at chains but sometimes they just can’t be beaten. Manteigaria, in this instance located within the Time Out Market in Lisbon, did an exceptional job. So much so that Stirling made an early call that they would be very hard to beat. The queues of Portuguese locals are an indicator of their popularity. As I wait for my own turn at the counter, I can hear the crunching of fresh pastry all around me, emanating from those who choose to stand with a coffee whilst having their mid-morning snack. At €1 each they are a bargain, considering the amount of effort that goes into their production. The pastry was extremely light and very flaky. With a hint of cinnamon, and lightly torched on the top, both the pastry and the warm eggy custard just melted away in our mouth. The custard held together well, not too runny, and definitely not too stiff, the walls of the pastry doing its job and holding it all together. Stirling particularly loved the amount of cinnamon in this one. We both agreed that these were going to be hard to beat. So, we did what everyone is told to do when they visit Lisbon. We visited Belem, to eat the Pasteis de Belem. I have no immediate problem with this because until you try something, you can’t possibly offer a credible opinion. Also, if we were serious about tasting these tarts, then including the Pasteis de Belem was a must. As I mentioned in my article on things to do in Belem, the queues outside this store are outrageous. While we were there we saw no less than four massive tourist buses appear and that doesn’t take into account those getting here under their own steam. Crazy stuff! We chose not to queue, and went inside where it was much calmer. We made a mistake here, in my opinion. Fresh from eating some amazing tarts at Manteigaria the previous day, Stirling bolstered up the order and suddenly six appeared on our table. They looked amazing, all yellow and crunchy and we were keen to tuck in. Now, this is where I am probably at odds with those promoting the “best Pasteis de Nata” in Lisbon. I just don’t think they step up to the plate. Don’t get me wrong. They are still very good. Served warm, the custard is light and perhaps more eggy tasting than any others. The pastry, however, was hard and had clearly been cooked a lot longer. You can even see in this image that the pastry is a much darker brown than any of the others we ate. Having eaten three of these all at once, I’m fairly confident in my decision. Yes, they are good, but I think people just come here now because guidebooks and online articles tell people they should, just because it is iconic and not necessarily because they are the best. Still, you can’t beat them for being authentic and with such a rich history as the originators of these tarts, they are still an important part of the Lisbon community. On the way up to the Miradouro de Sao Pedro de Alcantara, we popped into a small pastelaria. Filled with locals getting their morning breakfast, this was as authentic as it could get and well off the usual tourist trail. Here, we tried the mini Pasteis de Nata although I’m not sure why. My first tip would be, don’t do this. If you are going to have one, go the whole hog and have a regular size one. When they are too small, there’s not enough custard in them and they become more pastry than custard. This isn’t a bad thing of course if the custard is perfect. The pastry here was less flaky and a little more stuck together. In my mind, they could have been baked the day before, however, I suspect that the problem was largely related to them being cold, leading to my second recommendation. Wherever possible eat them warm. It keeps the custard warm and flowing and the pastry perfect. Whilst these were ok, they were probably at the bottom of our list. We worked up an appetite walking through the Alfama district and in the grounds of the Castelo Sao Jorge, so we were pleased to find the Santo Antonio Pastelaria nearby In a traditional tiled Lisbon building, the bakery produces mountains of them every day. The pastry was perfectly light and crunchy. I could just feel my mouth pushing through layer upon layer. They were so flaky. The custard was much warmer than any others we had tried and the absence of cinnamon in these appeased my taste buds better. All pastelarias selling these tarts always have a separate shaker of cinnamon on hand for those that like a little more. We noted that these Pasteis de Nata were definitely more scorched on the top. In Coimbra, 200 kilometres north of Lisbon, Briosa is one of the oldest cafes in town. What better place then to test out their local version of the Pasteis de Nata. For no additional charge, you can eat your tart in style inside their cafe. We chose to do so, seeing it was just too beautiful to pass up and had our two sweet treats delivered promptly to our table. Once again, the pastry was flaky and the custard moderately warm, without being overly sweet. They were good, good enough to consider going back for another one. Along the Rua de Santa Catarina, Porto’s pedestrianised shopping street, you will find many shops, cafes and restaurants all trying to command your attention. If eating Pasteis de Nata is your thing, you’ll also find many places to taste test. We had to stop at two, deciding to leave the chain Nata, whose tagline is “the world needs Nata” off the list. Ordering in my dodgy Portuguese, I must have delighted the lady serving us who provided our two Pasteis de Nata with the biggest smile I’ve ever seen. We ate these outside, rustling at the paper trying to get it unwrapped as quickly as possible as we stood in the middle of the mall and devoured them. Unfortunately, the staff member’s enthusiasm didn’t match the product we were eating. Cold, and with a very tough pastry, the custard was the end result of a Pasteis de Nata cardinal sin. It was made on custard powder. Bright yellow, the taste was off and the texture was grainy. An epic fail. Thankfully, we found our saviour for the day a little further down the road. Here you can have a quick bite on bar tables and stools on the lower level, or head upstairs for comfortable armchairs and sofas. Watch the bakers through the glass windows on your way in as you try to keep to your decision to eat only one. As you line up to place your order, you can watch the overhead display of baking trays as they circumnavigate the roof. Fabrica de Nata was a winner on two levels. Firstly, the all-important tart. They were beautiful and quite possibly the best we’d eaten since leaving Lisbon. Incredibly light the pastry cases had clearly been in the oven not so long ago. Served warm, and without cinnamon once again, they were scrumptious. Whilst you can eat these all on their own, and I do recommend doing that, here at this pastelaria, they offer the opportunity to have one served with a glass of local port. When in Porto, it seems very civilised to be eating them whilst sipping on a port. What a great idea and all for only €2.20. So after eating our way around a few cities, our verdict was split. Stirling’s final recommendation lay firmly with Manteigaria, the first Pasteis de Nata he tried. I thought this was quite significant as he did a lot of tasting afterwards but still held onto the taste and mouth-feel of that first delightful bite in the market. Coming in as his number two, was the Fabrica de Nata in Porto. For my top gong, Santo Antonio Pastelaria in the Alfama district narrowly beat Manteigaria and Fabrica de Nata. I honestly found both of those hard to split. The last place, which we both agreed on, unfortunately, went to Cafeteria Imperio in Porto. Cold, tough pastry with a cheap custard filling is never going to make the grade in a country renowned for perfection in this area. When the discussion of Pasteis de Nata vs Pasteis de Belem came up, we also agreed. They were great, but they are definitely not the best around. If it wasn’t necessary to test them in order to be able to compare, and if it wasn’t for Belem being a beautiful part of Lisbon to visit anyway, I wouldn’t bother going out there just to try one. With the knowledge we have now, I’d save my time and head to one of the other locations and eat a few more there. I suspect that Manteigaria is the one to watch for the future. It’s already laying claim to having the best Pasteis de Nata in Portugal and I can see why. With a few more locations opening up in Lisbon and other parts of Portugal, they are more easily accessible than the Pasteis de Belem. With a flavoursome custard and excellent pastry, the locals love for them is growing. This is by no means an exclusive or exhaustive list. We would have to live there for years to be able to attempt this and even then, it would be difficult. Hopefully, however, it’s a guide for you to either try these places out or to avoid the ones that were not up to scratch. It should also provide you with a base understanding of them and the key features of Pasteis de Nata that you should look out for. Assessing the pastry from a distance is hard, as is the texture of the custard, but if you are having them served warm, then at least you are off to a good start. The part I was pleasantly surprised with, and this applied to every one we ate, was that they aren’t overly sweet. Sugar is definitely used in the making of the custard but it is kept to a minimum. Eating a violently sweet one is a sure sign it’s not authentic. Perhaps this is why everyone feels they can eat more than one? Bon appetite and may you also find your perfect Pasteis de Nata.